As a matter of fact, when compared to traditional solo mail, it’s not even close. We’ll save you money! Eye catching full color postcards deliver your message directly into the hands of your best prospects. Unlike other media, the mail requires recipients to take some sort of action when they receive your card. This is your moment! Most will see and read the offers you share. Consumers will respond to local businesses when they receive relevant promotions inviting them to do business. 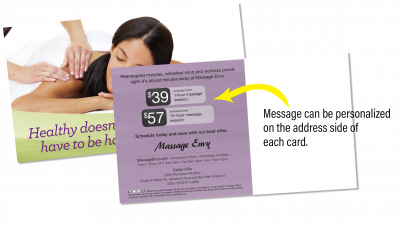 Take advantage of this highly effective way to reach your local market with affordable postcards. Anyone can mail a postcard. Knowing who and where to send it is a critical part of the equation. Our research team is knowledgeable on the key demographics to target for your particular business. Using state of the art analytics and mapping technology, we will provide you with a strategy designed to target the best potential prospects that ensure the greatest response rates. It’s not guesswork, it’s experience and technology working together to deliver results. We know your customers and their consumer habits and target the right audience with the right message for you. Partnering with our parent company, Signature Graphics, one of the largest printers in the Pacific Northwest, we offer design, print, and mailing for one low price. With our target marketing, we get results and a positive return on your advertising spend. Holding something in your hand, your mind is subconsciously evaluating the object… the weight of it, the texture, the color, and the subject matter. Involving more senses than viewing a message on a screen, your brain is better equipped to recall the experience with that object and make a connection. Visuals Rule. The brain processes visuals 60,000 times faster than the time it takes the brain to decode text. Selling your story with pictures and graphics is a must. 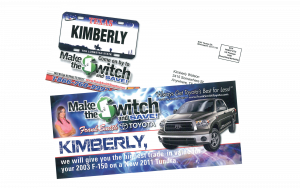 Did You Know that Personalizing Direct Mail Makes a Big Difference in Response? The Variable Smart Card works for every business with a vibrant image and eye-catching personalized message and offer on the front and the back of the postcard. The card is designed with an unique size of 4″ x 9″ so it will stand out from the other pieces in your mail, recipients cannot resist reading the details front and back. Like the Variable Smart Card, the Message Smart still allows you to deliver a personalized message on the address side of the card while the image side of the card remains the same for all recipients.